Despite the amount of technology in a shiny new smartphone, it’s hard not to feel a bit of sticker shock when buying one. Here’s something that may be even more shocking: as much as one third of what you paid for that new smartphone goes not for hardware but to pay patent royalties to companies you may not have even heard of. This holiday season, we invite you to spend a few minutes getting to know the invisible patents buried in that new device. The average smartphone is tied to almost 250,000 patents from hundreds of companies. Royalties for these patents contribute to, on average, roughly 30% of the price of a smartphone. 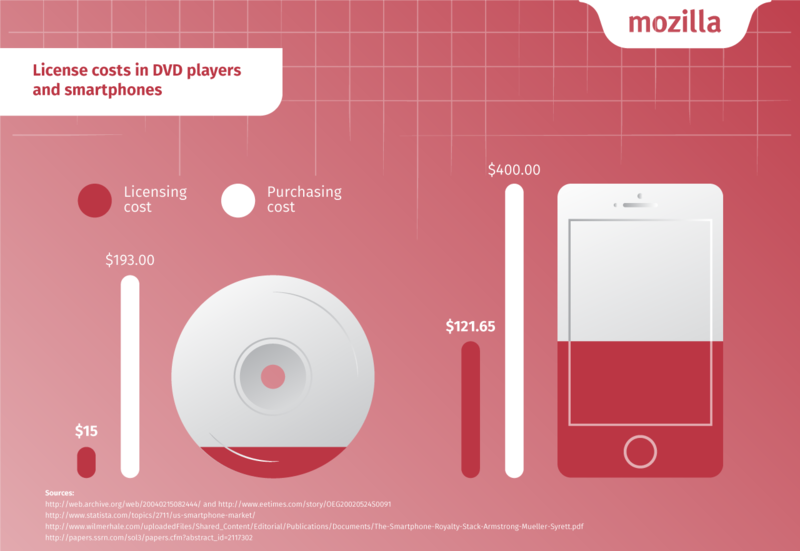 For a historical comparison, in 2002, the license costs built into the price of a DVD player only made up around 10% of its total price. When you dig deeper into each component in a smartphone, you quickly see how these costs can start to add up. In some instances, the royalty cost dramatically outstrips the price of the component itself. For an extreme example, the materials and manufacturing costs of each WiFi chip tallies a few dollars while the combined licensing fees are over $50. So, what’s the lesson here? In some industries, patents can positively influence the advancement of technology and research when those patents provide incentives for innovation. At the same time, patents can have a major impact on users’ pocketbooks. Equally important, the costs of patents and threat of patent suits can significantly impact start-ups and other smaller innovators that may need to pony up sums only affordable to big companies simply to create basic competitive products. This is why Mozilla is working on identifying and reducing the negative effects of the patent system on innovation. From our legal initiatives to our work on open patent strategies and groundbreaking collaborations around royalty free standards we work hard to help keep the next generation of technologies open and innovative. 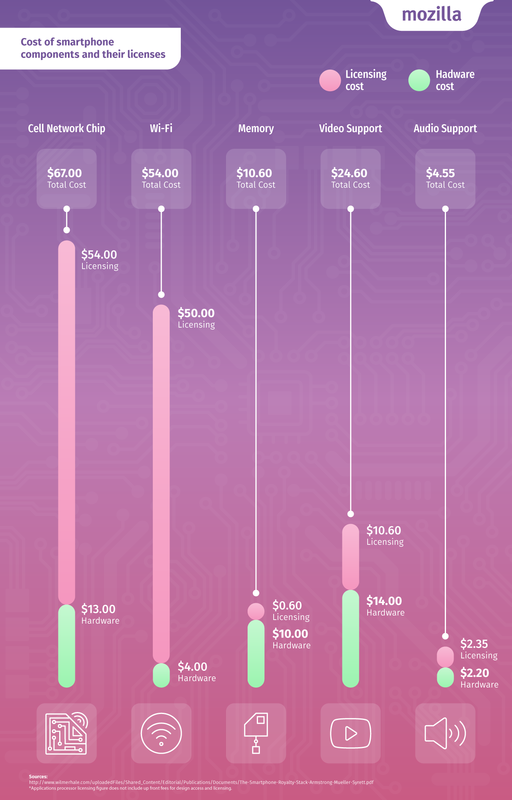 We hope that the next time you hold a new smartphone, marveling at both the technology and the cost, you’ll understand a bit more about what went into its price and what it takes to make the “Next Big Thing”. Download a pdf of the charts.